India’s much-anticipated tour of Australia began with the T20 leg. The first of the 3 games was played at the Gabba, Brisbane. The crowd was entertained to the fullest the game went to the last over. The hosts managed to edge past the visitors but the Men in Blue were rusty as they dropped crucial catches and played rash strokes. Indian skipper Virat Kohli won the toss and had no hesitation in opting to bowl. Bhuvneshwar and Bumrah made a good start and gave away just 12 runs in 3 overs. Aaron Finch began to open up but D’Arcy Short was struggling. Khaleel Ahmed came into the attack and removed Short for 7 off the first ball. After the first powerplay, the score was 38/1 as India didn’t let the batsmen run away. Chris Lynn, the No.3 batsman, then unleashed himself. He struck Khaleel for 3 sixes in the 8th over. But the man with the golden-arm, Kuldeep Yadav struck at the other end as he sent back Finch for 27. The spinner shone again by removing the danger-man Lynn for 37 in his next over. After 12 overs, Australia reached 90/3 as the game hung in balance. 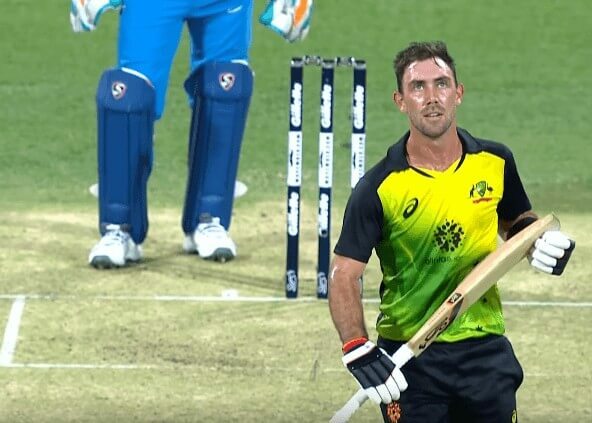 Marcus Stoinis and Glenn Maxwell came together and put the pressure back. Maxwell hit Krunal Pandya for 3 consecutive sixes in the 14th over. They put up a 50-stand in no time and all of a sudden, the score raced off to 152/3 from 16 overs. That’s when the rain gods decided to intervene. A halt of more than an hour meant that the game was reduced to 17 overs a side as Australia finished with 158/4. India had a revised target of 174 from 17 overs as per the DLS method. Shikhar Dhawan began well by hitting 2 fours in the first over bowled by Jason Behrendorff. He was batting nicely and found most of the strike. After 4 overs, the Dhawan scored 27 off 17 balls while Rohit Sharma faced only 7 balls. Behrendorff accounted for Rohit’s wicket in the 5th over. Dhawan kept going as the score reached 53/1 after 6 overs. He brought up his half-century off 28 balls in the 8th over as India was in a commanding position. Adam Zampa got KL Rahul out stumped for 13 in the next over. Kohli walked in at No.4 and looked edgy. He wasn’t able to time the ball and his short stay was ended by Zampa for 5 in the 11th over. Dhawan was looking set for a big one but in the hunt to score heavy, he fell for 76 to Behrendorff. After that, India was struggling at 109/4 after 12 overs. Dinesh Karthik and Rishabh Pant came together and brought the side back into the chase. The 14th over bowled by Andrew Tye went for 25 runs as the Indian duo brought the equation in India’s favor. India needed 35 from 3 overs. Stoinis’s 15th over went for 11 and the penultimate over of Tye also conceded 11. But Tye bagged an important wicket of Pant for 20. With 13 to get from the last over, India relied on Karthik to bring them home. But Krunal had the strike and he could score just 2 from 3 balls and also got out in the process. Pressure mounted and Karthik too got out on the next ball. In the end, India fell short by 4 runs.